6th stop of our Bohol Countryside Tour, Day 2 in Bohol (January 29 - 31, 2010). 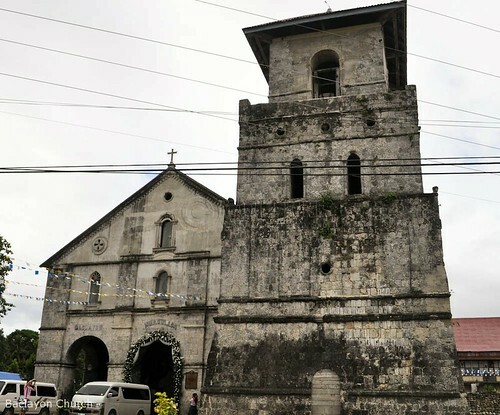 The Church of the Our Lady of Immaculate Conception in in Baclayon, Bohol is considered as one of the oldest churches in the Philippines. A visita was built in the same spot in 1595 with the arrival of Jesuit priests in the Philippines. 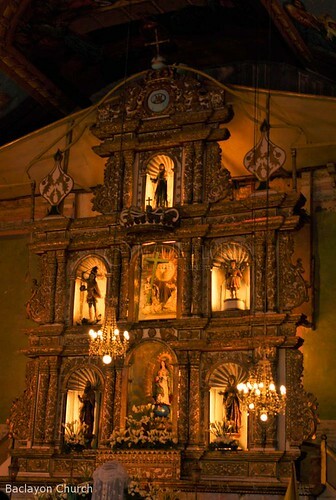 However, it was only in 1717 that Baclayon became a parish which began the construction of the church. Around 200 workers constructed the church until it was completed in 1727. Later in 1835, the church's bell was installed. I consider Baclayon Church as the most solemn church I have ever been to. The church administrators are strict in implementing proper decorum inside the church that they wouldn't allow people wearing sleeveless shirts, shorts, and short skirts from entering the church interior. My husband, who was wearing a sando when we visited, was given a blanket that he used as a cape to cover his arms. Beside the church is an old convent with its second floor converted as a small museum of artifacts. My boy wanted to see what's inside so we paid the 25 peso fee by the entrance. Picture taking is not allowed in the museum so I have no photos to share. Nevertheless, our eyes feasted on various antiques and centuries-old religious objects that the old church has kept all these years. Aside from the antique religious images, the museum also houses gold embroidered ecclesiastical vestments, sacred vessels, booklets, and librettos used during the Spanish times. We were also able to enter a small space that provided a view of the church below us. We were informed that, during the olden times, people of high stature heard mass inside the said private viewing area. There is also a small souvenir shop behind the church's premises. Various religious souvenirs and other Boholano products are sold there. Baclayon is a town 6 kilometers east of Bohol's capital city, Tagbilaran. To go there, you can ride a jeepney or a bus from Tagbilaran and you will easily see the church since it's just beside the high way. I would recommend hiring a van for the whole day since the drivers also act as tour guides. Our 8-hour countryside road trip cost us Php 3,500 pesos.